As the Kyoto Protocol limps along without the participation of the US and Australia, on-going climate negotiations are plagued by competing national and business interests that are creating stumbling blocks to success. Climate Change Negotiations: A Guide to Resolving Disputes and Facilitating Multilateral Cooperation asks how these persistent obstacles can be down-scaled, approaching them from five professional perspectives: a top policy-maker, a senior negotiator, a leading scientist, an international lawyer, and a sociologist who is observing the process. The authors identify the major problems, including great power strategies (the EU, the US and Russia), leadership, the role of NGOs, capacity and knowledge-building, airline industry emissions, insurance and risk transfer instruments, problems of cost benefit analysis, the IPCC in the post-Kyoto situation, and verification and institutional design. A new key concept is introduced: strategic facilitation. 'Strategic facilitation' has a long time frame, a forward-looking orientation and aims to support the overall negotiation process rather than individual actors. 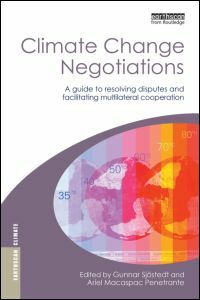 This book is aimed at academics, university students and practitioners who are directly or indirectly engaged in the international climate negotiation as policy makers, diplomats or experts.